Climb to our highest peak, 4 stories high in the trees. See the beautiful St. John River through the forest. Feel grounded by the silence. Step to the edge of the platform and clip in. Take a deep breath of fresh air. Get ready. Set. JUMP! Our Flying Squirrel is a platform 36 feet above the ground in the trees. It is built with a special jump line support system designed to catch you after a 10-foot free fall and then safely glide you to the ground at a controlled speed with a soft landing. This course gets the adrenaline pumping and gives you a true taste of adventure. This is certainly something to add to your summer bucket list. The Flying Squirrel is available as a Go Wild adventure. To soar like a Flying Squirrel, you must weigh within 45 lbs & 270 lbs (wearing full gear). Find out about what pricing packages we offer with this amazing experience! These are mandatory; we recommend work or fingerless athletic gloves. If you don’t have your own, we sell them for $3.50 for youth and adults or $2 for children. We offer the option to complete it online, or you can fill it out when you get to the park. Note that any participants under 19 must have their waiver signed by a parent or legal guardian. Make sure that at least one person in your group brings a government-issued photo ID to temporarily exchange for your party's safety equipment (harnesses, helmets, etc.). We will keep this ID safe and sound attached to card specifying the number in your party. After your adventure, and once all of the gear is brought back to our front office, you receive your ID back. For any of your personal belongings, we have lockers available for rent at $4, for the duration of your visit. Limited availability. All climbers under 16 need a supervising adult on site (someone 18 or older). For ages 12-15, the supervising adult can watch from the ground and can supervise anywhere from 1-5 climbers. For climbers aged 8-11, the supervising adult (18+) must be climbing with the group and can supervise anywhere from 1-3 younger climbers. Safety is our number one priority (ensuring you have a good time is a close second!). We use a top-of-the-line Bornack SSB (Smart Safe Belay) carabiner system, which ensures the user can’t accidentally unclip themselves from the safety line while in a course. Climbers are always secured with at least one carabiner until their feet are back on the ground. We also use the latest helmets and full-body harnesses to further ensure your experience is the safest it can be. 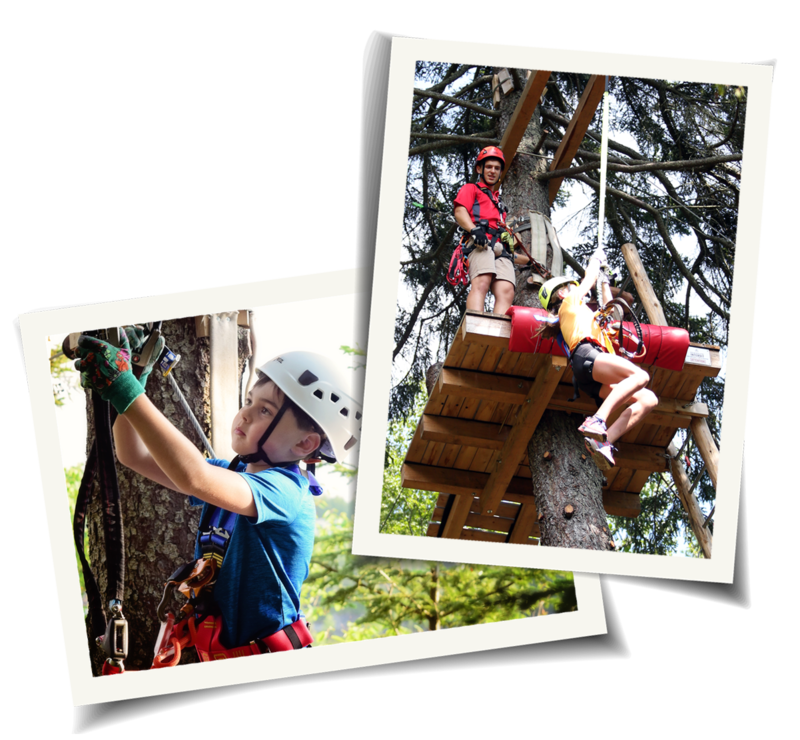 In Canada, usually treetop adventure parks opt in to specific safety regulations set by ACCT in the US as a minimum. We do more than simply meet these regulations – in fact, we’ve chosen to build our park to go beyond North American standards. We’ve opted to build and be inspected to the more stringent European safety standards – ones that have been around for nearly 30 years and were created in a place where parks like ours are much more common.